Figure 1. pH and osmotic homeostastis in Lactobacillus plantarum. Panel A shows three main systems whose function is to maintain pH homeostasis in L. plantarum. The F0F1-ATPase (left) is a primary proton pump that extrudes protons from the inside to the outside, using ATP as the energy source. In contrast, the malate and arginine systems rely on product efflux to drive uptake (no energy is required). In the malolactate system (center), proton consumption de-acidifies the medium and raises the pH. In the arginine diiminase system (right), medium pH is raised by virtue of the two molecules of NH3 that are released per mole of arginine. Panel B shows the QacT system responsible for osmotic homeostasis in L. plantarum. The components of this putative opuABCD-encoded system (left) include membrane-associated substrate-binding proteins (S-BP), a betaine permease, and ATP-binding proteins (ATP-BP). When the osmotic pressure is high, betaine is bound by the S-BP and taken up by the permease (center). 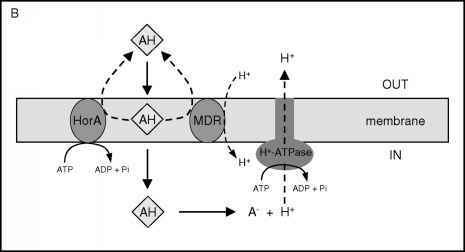 Transport is driven by an ATPase following ATP-binding. If the osmotic pressure is reduced, accumulated betaine is effluxed via membrane channels (right).